The story about Avante begins with brothers Kelly and Rene Spence, growing up in their father Ed’s retail store, where they were exposed early-on to the necessity of product and merchandise promotion. The two brothers started out their own careers as cabinet and furniture makers. This, combined with their retail background, gave Kelly and Rene the opportunity to develop the creativity and skills essential for the designing and manufacturing of attractive, successful point of purchase displays. 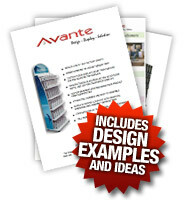 Founded in 1989, Avante has been designing, manufacturing and providing point of purchase display solutions ever since. Along the way, they have been recognized with international design quality awards, patents and many well-respected clients. By way of a commitment to service and quality, they would like add your respected company to that list.